textured cotton fabric from Diamond Textiles. My mom's favorite color was blue. My grandma's favorite color was yellow. My mother-in-law's favorite color is green. Me? I like all the colors. Sometimes, when I'm immersed in a particular color palette in my work, it reminds me of a special person in my life. Does the same happen to you? 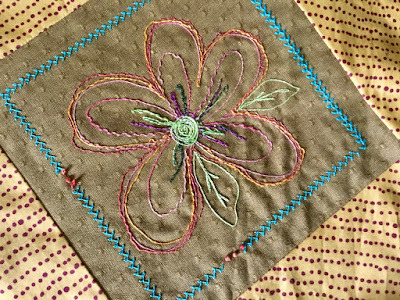 If color and stitch tickles your fancy, feeds your creativity or elicits a special memory, there is an abundance of new threads on the market these days in colors that span the rainbow. The heavier weight threads are the ones catching my eye and I enjoy using them for both hand and machine stitching. 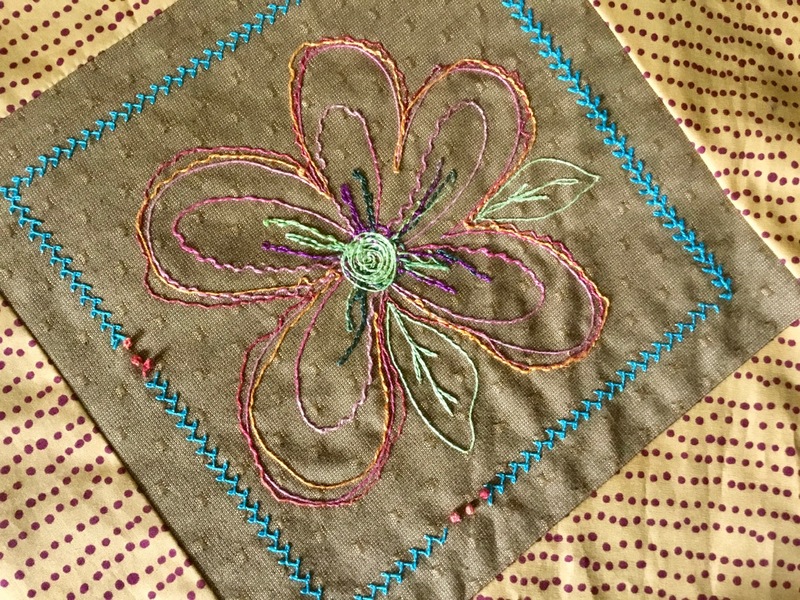 Here are some experiments with decorative stitches and free-motion bobbin work using Eleganza perle cotton from WonderFil Specialty Threads. Eleganza comes in weights: #3, #5 and #8. The perle cotton thread is loaded in the bobbin and I use a 50 wt. 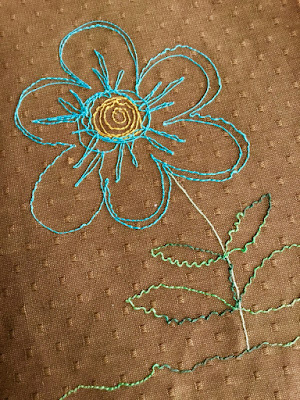 cotton thread in a coordinating color for the top thread. Try stitching with the feed dogs up... or down. Free-motion bobbin work with perle cotton threads. French knots and a few lazy daisy stitches were added by hand. French knots were added by hand. 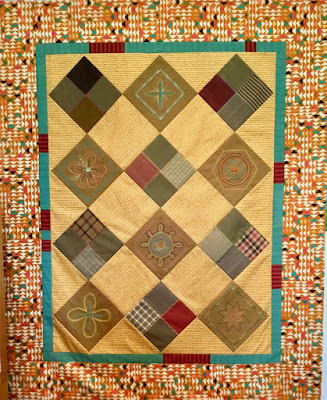 Next up are 4-patch quilt blocks highlighted with decorative machine stitches in a 12 wt. cotton thread [Spaghetti from WonderFil]. The fabrics I am stitching with are yarn-dyed cottons from Diamond Textiles. These fabrics are easy to stitch with and serve as the perfect canvas to show off these fat, colorful threads. 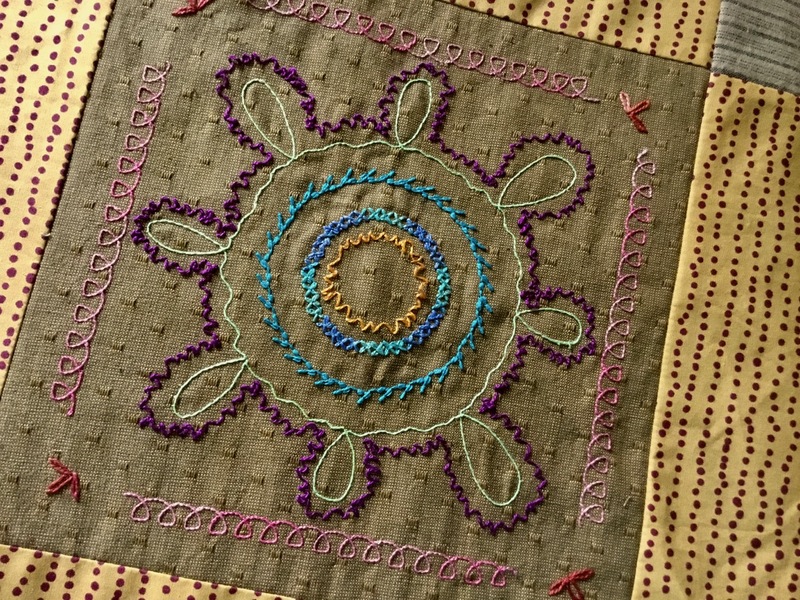 Decorative stitching with 12 wt. cotton threads. Remember to use a larger needle to accommodate a 12 wt. thread. Yarn-dyed woven fabrics are a perfect partner for decorative stitching. Heavier threads beg to be the center of attention... and I indulge them. They challenge me to draw with them—by machine and by hand. 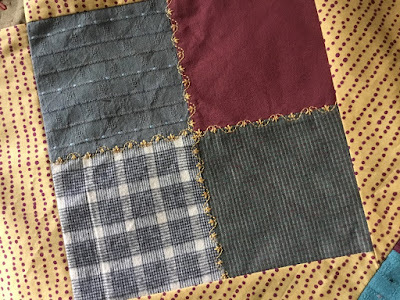 About a month ago, I decided to gather up my threadwork experiments and combine them into a quilt top. The alternate squares, setting triangles and the outer border are from the Indie Folk fabric collection from Art Gallery Fabrics. 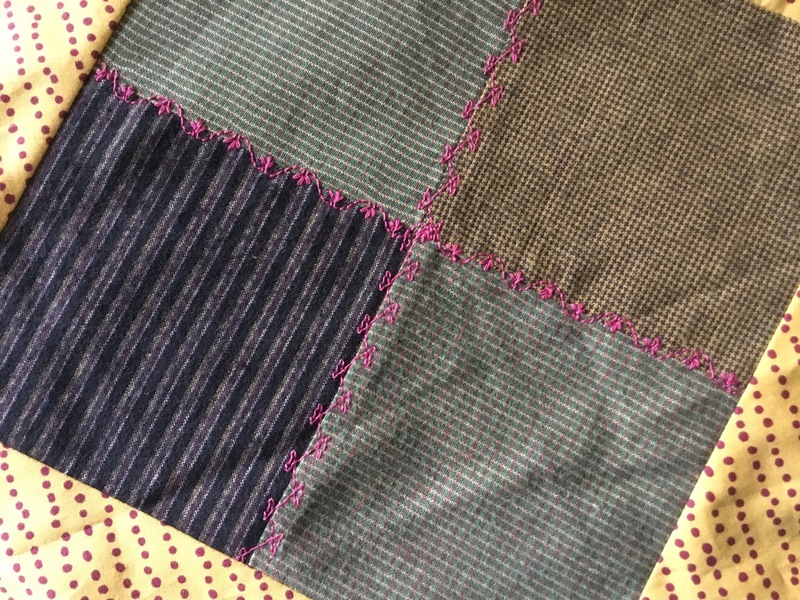 The inside narrow border are more textured yarn-dyed fabrics from Diamond Textiles. 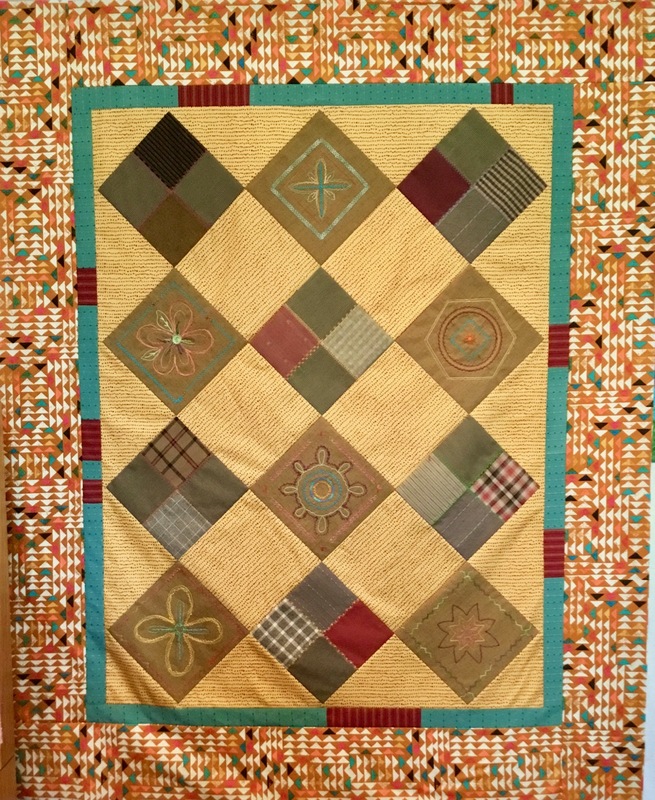 I think my Gram would like this quilt because it has a lot of yellow in it. A Happy Mother's Day to all the moms, grandmoms, moms-in-law and anyone else that cares, nurtures, loves and encourages us to do and be the best we can.